Skyline Rotorua is now home to New Zealand's first year-round Gondola assisted bike lift, accessing world-class downhill mountain biking. Skyline Rotorua MTB Gravity Park gives riders easy access to a 10.5 kilometre trail network featuring trails with varying terrain for all ability levels. Soak up the scenery cruising down Simple Jack, or see the trees as a blur as you rip into steep techie terrain on Ten Fifty One. The Skyline gondola takes the hard work out of the park's 200-metre vertical rise. The dedicated gondola cabins are designed to take up to four bikes and riders per trip allowing up to 3000 downhill runs per day. Skyline Rotorua offers a range of Gondola assisted bike passes, from half day to full day or season pass. Ride from as little as $2 per run with our new uplift passes. Check out the website for more details and images. Review: Almost certainly worth a look if you can afford it. 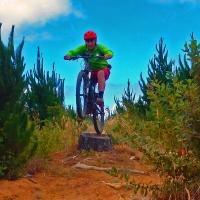 Skyline Gravity Bike Park MTB Trail 3.00 out of 5 based on 1 ratings. 1 user reviews.